Congratulations to "Janice H." and "Bn100", the winners in Susanne's giveaway. Thank you to all who participated! Hello. It’s always a pleasure to visit with you here at Just Romantic Suspense and today is no exception. Please comment below with your contact information to win one of two electronic copies of Sworn to Protect, my latest romantic suspense novel, now available exclusively from Amazon. 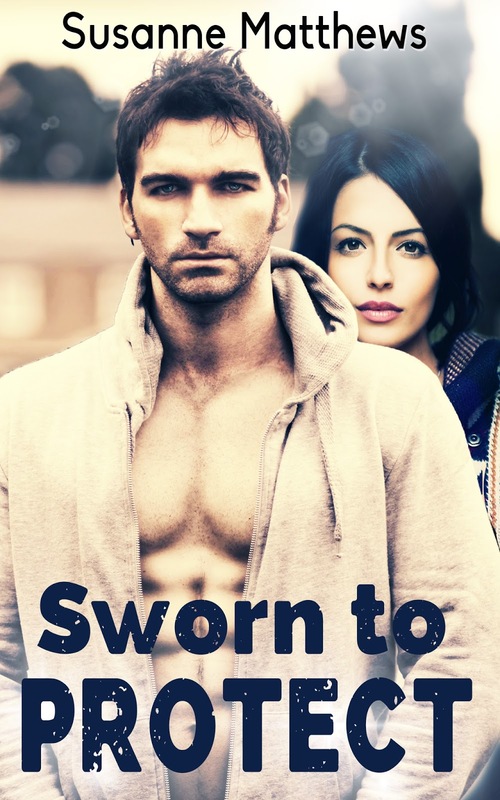 Sworn to Protect is my twelfth suspense novel out of the nineteen I’ve written, along with two novellas and three short stories, not to mention three episodes of a sci-fi series. Can you guess which is my preferred genre? It’s hard to believe that I’ve written so much in what is essentially a short period of time. I began crafting Fire Angel, my first published novel, in the fall of 2012. Now that I’ve begun writing, it seems I can’t stop. It’s taken on a life of its own. People ask me where all the ideas come from, and I can’t truly answer that question because I don’t know. Most of the time they spring into my head from a news report, something I see on television, or just weird crazy dreams I have. Occasionally, the books evolve from a title, but sometimes, as the story writes itself, the title I started with no longer fits. I am a pantser. That means essentially that I don’t plan my books. I don’t write character sketches, goals, aims, and motivation charts, synopses, or plot outlines. I sit at the computer, type in the words Chapter One, and I let the ideas flow. My characters take over the story and drag me along with them. I can do all of the above once the book is written, but until it is, I’m in the same place as the reader, dying to find out what will happen next. When I write, I commit another grave writing sin: I revise and edit as I go along, adding information, taking some away as needed. When I finish the book, I go back in and make changes once more, until I’m satisfied that the manuscript is as good as I can make it. The finished product rarely resembles the original work. I rely on my beta reader for advice and check my reviews to see what I could’ve done better. Was there enough suspense? Did I develop the characters as fully as I should’ve? And tons of other questions I ask myself before I sit at the computer and start the next one. Sworn to Protect is one of those stories that came to me in bits and pieces from several different things. I’ve written another novel, On His Watch, where a woman suffered severe head trauma and had amnesia, and I’d done a lot of research on the topic at the time. Retrograde amnesia can take on many different forms. I had that on my mind when a friend who was undergoing a bad break-up said, “If only the last ten years had never happened.” That got me thinking. Haven’t we all wished we could just forget the bad things that have happened to us? Wouldn’t we like a do-over at times? But does getting what we wish for turn out the way we hoped it would? Well, in Sworn to Protect, the heroine gets what she wishes for, but along with the sad memories, she also loses vital ones. Someone wants her dead, and since she neither remembers the attack, nor the reason why someone would want to kill her, it falls on her husband—a man she remembers but doesn’t recall marrying—to keep her safe. For Neil, this is a rare second chance at love and life with the woman he loves. He just needs to keep her alive to do it. As far as the rest of the plot goes, it’s a mixture of elements that range from national security to embezzlement and fraud. What does Nancy know that no one else can figure out? Will she remember in time to save her life? You’ll have to read the book to find out. Please comment below with your contact information to win one of two electronic copies of Sworn to Protect. Giveaway ends 11:59pm EST June 27th. Please supply your email in the post. You may use spaces or full text for security. (ex. jsmith at gmail dot com) If you do not wish to supply your email, or have trouble posting, please email maureen@justromanticsuspense.com with a subject title of JRS GIVEAWAY to be entered in the current giveaway. Thank you so much for having me on again. I love visiting here. You're welcome. I hope you'll read the book and enjoy it. One never knows what can trigger the amnesiac's memory. Sounds like a great read. It would be great to be able to go back to a time or event in our past and get a do-over. As they say, hindsight is 20-20. Given that second chance, how many of us would do or say the wrong thing again? Neil has the opportunity, I look forward to finding out how he handles it. I think we all wonder how we would do something that went wrong if we could redo it, and yet, no matter how bad some things might get, many of us would do exactly the same things again.